Today we are joined by speaker, author, and encourager Vickie Petz Henderson. She won our hearts with the title of her devotion and her passion for community. We pray that you will be blessed. Sometimes I can’t get to Jesus. Like the crippled man on the mat, I need to be carried. We all need a little help from our friends. One day I did more army push-ups than most 20-year old men, the next I could hardly lift my fork. My community of friends bought my groceries, took out my trash and drove me to the hospital for regular infusions after I was diagnosed with a rare neuromuscular disease. Accepting help was a blessing and prepared me for the approaching storm. When my husband left, I nearly drowned in my own tears. Before I needed help, now I needed CPR to survive the hurricane that blew away my life and destroyed my family. Friends carried me to Jesus before my grief carried me away. We are created to walk this thing called life together, especially when we are crawling on our bellies trying to survive. My hope is in Jesus, but sometimes I need help getting there. Friends grabbed me out the current and carried me to the Healer. They kept the crazy in my head from escaping. Life-threatening storms come without warning. Just like a day at the beach turned deadly when a thunderstorm popped up. Waves pounded stranded swimmers and the riptide plucked one off and sucked him under. Horrified witnesses locked arms and formed a human chain while rain pelted their skin and lightning threatened their lives. Anchored to Jesus, my chain of friends battled waves and reached out for me in the storm to carry me safely to my Savior. As I improved physically, I regained my independence and thanks to the friend chain, I’m getting there emotionally and spiritually too. They speak truth that points me to Jesus and He fills me with Himself. Now I’m strong enough to reach out and grab the hand of someone gasping for her last breath. And guess what? That puts my own feet on solid ground. If you’re drowning in turbulence, take the hand of a friend who is close to Jesus and can hold you tight. On your way out of the water, grab hold of someone else. You may be surprised; it gives you strength and stability when the waves pummel you. How many men carried their friend to Jesus? What lengths did they go to get their friend before Him? In verse 5 we read that Jesus saw something. What did he see? Reach out to someone today who needs holding. Perhaps you are in need right now and feel there is nowhere to turn. 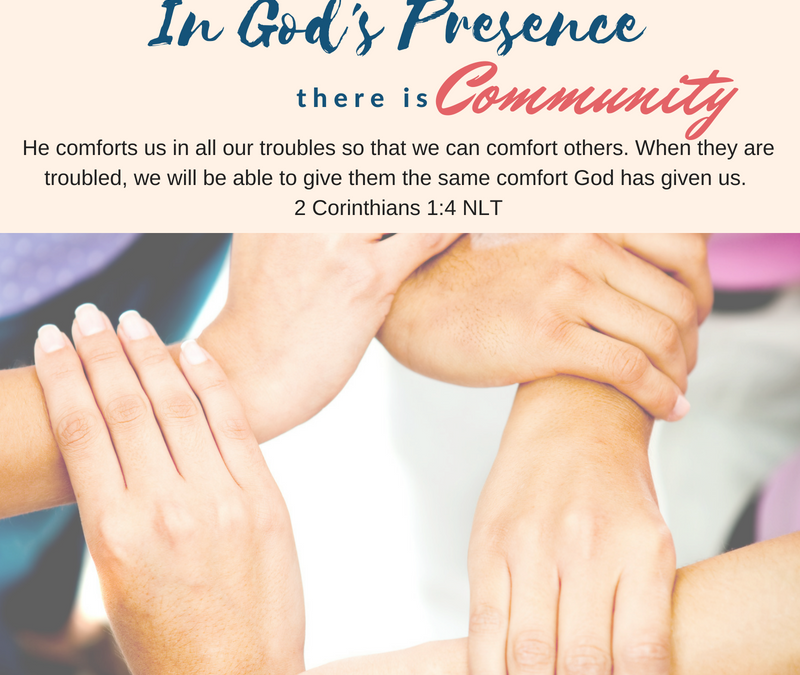 We are a community of praying women. If you need prayer please comment and let us pray with you today. We will join back Monday for week 2 of our mini-study, In God’s Presence. If you missed any day you can go back through over the weekend! As God has bless me early this morning .unable to stay asleep.heart is overwhelmed. The day I realized truly that it was inperative that I reach out to other brothers and sisters for support, encouragement and prayers, was a day my life changed forever! Before that I had cut myself off from all the ways Jesus wants to reach me with the loving hands of my church fellowship. Then I am truly able to comfort as I have been comforted! Praise God! Thank you for sharing Betsy. I’m so thankful you opened up to the support that God had waiting for you. Praising Him with you! Beautiful! We so need our community – I struggle with accepting help but thankfully my friends never give up on me. I have MORE been helped, pulled from the deep end several times by my dear friends. Thank you for these posts, I don’t always comment but I do read. I follow on Facebook and I’m loving the PDF’s – I can print them out and create a journal from them. Loving the ‘further study’ as well. Martha, Thank you for the comment and letting us know that the PDF’s help. We try hard to supply the tools that can help us study the word. I’m a journal girl too! love online, but there is something about writing it that helps me retain what I read. Blessings! This hit home with me. I came back this morning to read again. I need community. Haven’t had it in a while. We understand. Our circle can be big or small and there are times we feel alone. In those times, lean into God, tell him the desires of your heart, and watch for the unexpected. Blessings, Nancy.